The annals of history tell of an extraordinary development which commenced in late 1942 that involved thousands of people who had no inclination as to what it was they were contributing towards. The United States Army Corps of Engineers purchased 59,000 acres of countryside northwest of Knoxville, Tennessee, for purposes of development. To put it into perspective, it was enough land to build four cities the size of Manhattan on it. Three massive facilities were built of which one was deemed to be the largest building in the world at the time. 75,000 people flooded in and began work which brought with it housing developments that facilitated the growth of a town that would later become Oak Ridge. 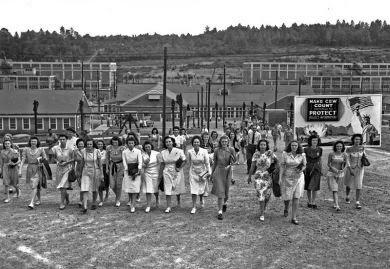 During the war years the mass number of jobs it created must have seemed exceedingly positive, yet nobody knew exactly what the purpose of the facility was, including the bulk of those who worked there. All designations were on a need to know bases and workers were limited to their specific function. If for example your job was to manufacture washers, you were expected to produce washers and not ask questions beyond that. At the time the town didn't appear on any maps either. In less than four years, the Army engineers had built nearly 10,000 homes, 90 two-story dormitories, 5,000 trailers, barracks and huts for 16,000 people, a dozen shopping centres, nine schools, two chapels and the nation's ninth-largest bus system. The manner in which the world eventually learn of its secret was through the mass media in the wake of the atomic bombs, dropped on Hiroshima and Nagasaki. The facility was indeed the birth place the atomic bomb (home to the Manhattan Project) and posters that donned the facility at the time read: "What you see here, what you do here, what you hear here, when you leave here, let it stay here."